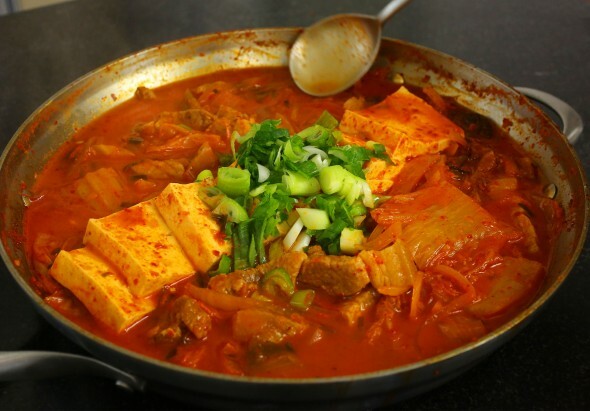 Kimchi stew is one of the most-loved of all the stews in Korean cuisine. 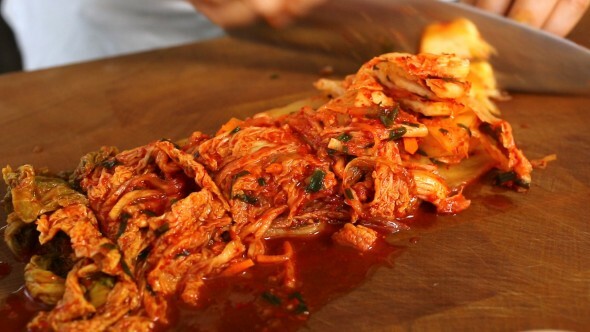 It’s a warm, hearty, spicy, savory, delicious dish that pretty much everyone loves. 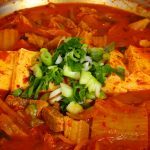 As long as they can handle spicy food, I never met a person who didn’t like kimchi-jjigae. What really made an impression on me at the time was the fact that they brought the stew out to the table uncooked, and then fired up a burner and cooked it at the table. This way we could sit and talk and watch it cook. 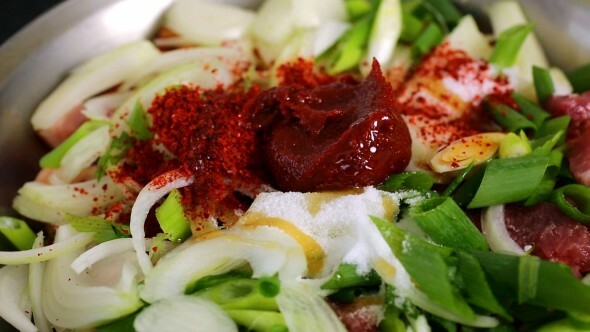 I could get a good look at the ingredients: kimchi, onion, green onion, thinly sliced pork on top, and seasonings. 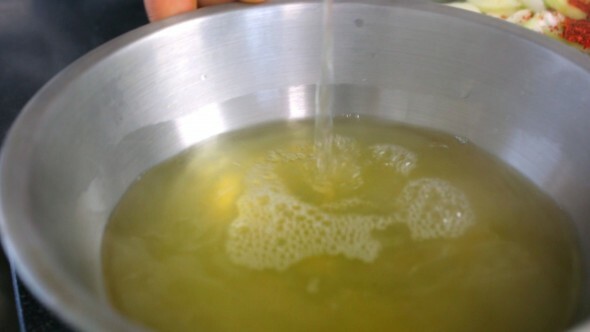 There was some white granules (salt, sugar, and probably MSG) and also they used water at the broth base. From this I developed my own recipe to make at home, which was very delicious. 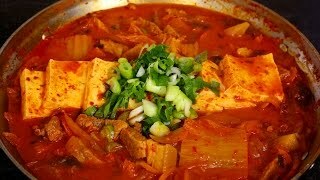 My kimchi-jjigae recipe served me well for years and years and I even made a video of it in 2007. But since then I developed this version, which is even more delicious. The secret is in the umami-rich anchovy stock. I hope you make it and enjoy it for years and years to come! Kimchi stew is thicker than kimchi soup. 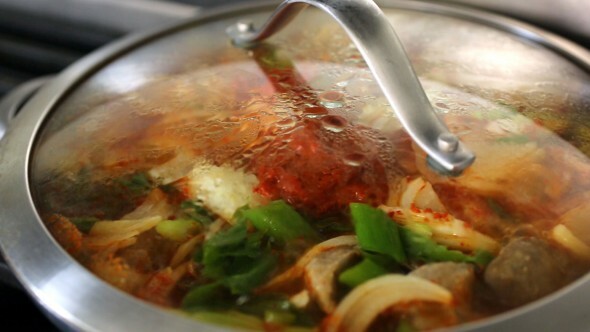 Kimchi soup is less salty than kimchi stew. Also, soup is always served in individual bowls, with rice. 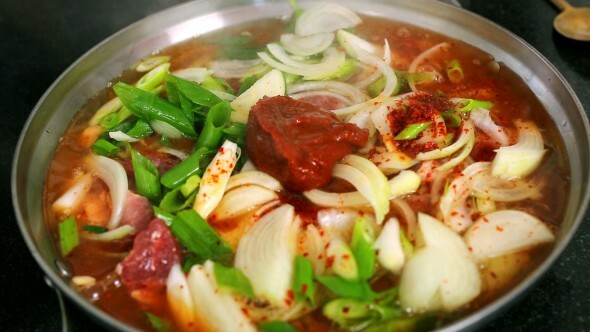 Traditionally in Korean cuisine stews were served in a big pot on the table, and the family would eat communally from the pot. 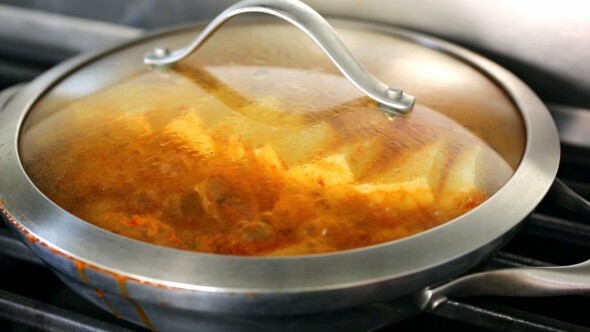 These days, some people (including me) get a little freaked out by double-dipping, so for stews I put individual bowls on the table, and a large spoon so that diners can take what they like from the pot and put it in their bowls. 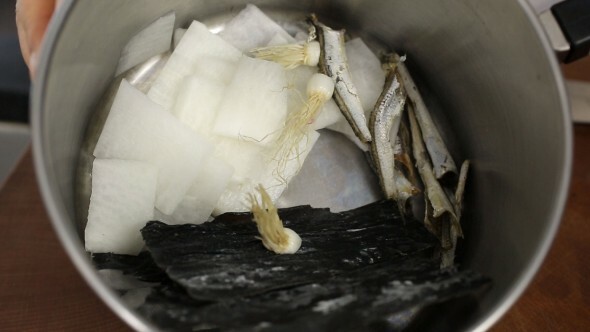 Put the anchovies, daikon, green onion roots, and dried kelp in a sauce pan. Add the water and boil for 20 minutes over medium high heat. Lower the heat to low for another 5 minutes. Slice 2 green onions diagonally and add them to the pot. Open and mix in the seasonings with a spoon. Lay the tofu over top. Chop 1 green onion and put it on the top of the stew. Remove from the heat and serve right away with rice. Posted on Monday, November 26th, 2007 at 9:09 pm. Last updated on September 7, 2017. Posted March 17th, 2019 at 1:49 pm | Log in to reply. Posted March 18th, 2019 at 11:33 pm | Log in to reply. 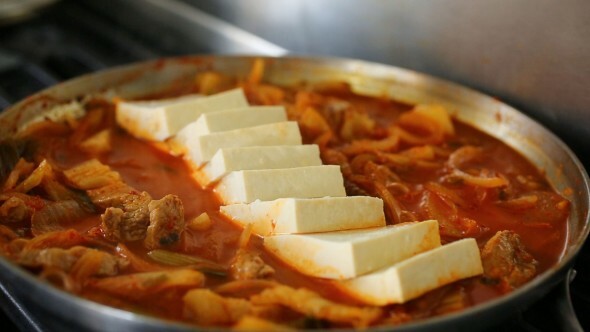 I’m glad your kimchi stew without meat turned out delicious! Great! Posted February 19th, 2019 at 2:52 pm | Log in to reply. Hey, i made it but can someone help me? I used 6 month old kimchi (homemade), and because of this it’s extremely sour. Is there a way to make it taste more mild? Posted February 27th, 2019 at 5:51 pm | Log in to reply. Posted February 7th, 2019 at 7:46 pm | Log in to reply. Wow! I liked this way more than I thought I would!!! I made your kimchi recipe about a month ago (half recipe) and still have about half left. I figured this would be a perfect recipe to use some up. I did use an “ultimate stock” recipe, but the heart of the recipe is yours. Thanks for such wonderful recipes. Side note, I’ve had an aversion to fish for a couple of decades. I used to eat fish as a child but several traumatic incidents has left me phobic. Because I watch your videos, I have been able to start eating dishes with fish sauce in them. Big step for me, all thanks to you! Posted December 25th, 2018 at 5:03 am | Log in to reply. Hi, I noticed that most of your stew recipes call for the same stock. Can I make it in advance to use over multiple days? Posted December 28th, 2018 at 5:19 pm | Log in to reply. Yes, you can make anchovy kelp stock in advance. Put it in airtight containers and freeze up to 1 month. This recipe was originally posted on November 26, 2007 at 9:09 pm by Maangchi. It was last updated on September 7, 2017. The video was watched 3,103,252 times on YouTube & has 37,791 likes! This video is a remade version of an earlier recipe. The original video was posted on 2007-11-26 and has 493,982 views.